Register now for the 2017 Convention: Click HERE. When you register, don’t forget to include registration for Thursday’s Workshop, “Words Without Borders” with Sandra Kowalczyk. Sandra will also be the convention keynote speaker on Friday. 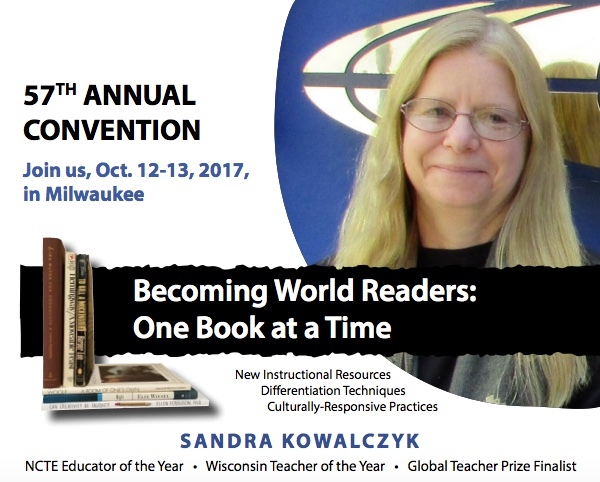 For many years, Sandra Kowalczyk has devoted herself to impacting students’ literacy in unique ways. She has received world-wide recognition for sharing artifacts from other countries with students while infusing ethnically diverse and global literature into her classroom. She has studied, researched and travelled to over 60 countries, searching for new and innovative ways to improve literacy in the United States. Her teaching approach brings literature to life by incorporating visual arts, music, technology and readers’ theater into the classroom. Using reading lists as boarding passes, Sandra’s students travel to far-off places. Reading journals have been re-envisioned as passports and students enjoy a departure lounge that incorporates pre-flight magazines and international newspapers. In addition, Sandra teaches literacy intervention classes for at-risk students and has started a highly-successful before-school program called “Breakfast with Books” which targets varying reading levels by involving students in differentiated literacy activities. 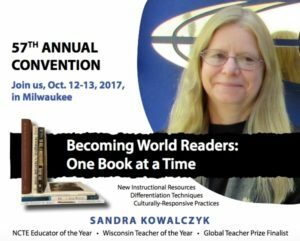 Worldwide, Sandra has won many teaching awards for promoting global literacy and has been recognized as one of America’s best. As a 2015 Global Teacher Prize finalist, Sandra will be attended the Global Education and Skills Forum this summer, in Dubai, U.A.E. She worked as part of a team in the initial stages of a “literacy toolkit” to be shared globally. The literacy team is comprised of 18 literacy educators from around the world who are/were Global Teacher Finalists. There are only three from the U.S. on the team: our keynote speaker, Sandra Kowalczyk, Nancie Atwell (author of the best-selling book, In the Middle), and Erin Gruwell (author of Freedom Writers).